Some things stay the same. Turin Brakes will always react to the previous record. And so, after Lost Property comes Invisible Storm: a lighter record, a shorter record and probably a bolder one. Getting into Lost Property proved to be difficult for me at first, because of the dark, moody vibe surrounding many of the album tracks. With Invisible Storm it proves difficult because of the pop current running underneath. Now, don’t get me wrong I like (indie) pop. But even for me, an opening salvo of Wait, Always and the excellent Lost in The Woods, closely followed by Life Forms was a bit overwhelming at first. In the end though, Turin Brakes don’t actually make music to please me. They just make music, which I happen to love – and live with everyday. And so, after living with it for a while TB8 grew on me immensely. So here are my thoughts…. The album, overall, is a labour of love in the form of a slick pop record. But it’s also still a Turin Brakes record. Because only Turin Brakes make this kind of pop music right now. And it’s only pop in the sense that there’s something immediately gratifying about hearing these songs for the first time. And it’s Turin Brakes in the sense that they keep on giving when listening again and again. Song by Song, Then? Okay… Would You Be Mine is a great, great song that has set-opener written all over it for the upcoming tour. Its driving rhythm, its angst-filled lyrics and the great guitar work and even greater bass riff, may have surprised some – including myself, but it works so well. Besides, in the context of Invisible Storm it sets a scene. While not as poppy as the other songs, thematically it kicks off a recurring theme of blending our inner feelings with outer turmoil going on. Whether President Donald Trump is one those Great White Apes with the nuclear codes, one can only guess. But I have a feeling he is…. Single Wait started off as a much moodier song, as can be heard in the acoustic version available as a download, but here it has handclaps, mandolins and synths, borrowing from influences like OutKast and others. It has a truly rich production, proving for a slick song that only gets better with more airplay. It has quintessential Olly lyrics (hello Jet Trail), which makes it a clear Turin Brakes song in an irresistible format. Then it’s Always, a song that I have a slight uneasy relationship with. It’s almost a sequel to Wait, indie pop with a bigger focus on the outside world. Other reviewers note similarity to Simon & Garfunkel, but I just get slightly distracted by the effects going on in the background. While the song makes perfect sense in the context of the album, it’s the one song on this record I have yet to click with. Which probably means I just need to spend more time with it…. Now Lost In The Woods… Wow. I know I have a bad track record when it comes to predicting Turin Brakes singles. If I had been right, Guess You Heard would have propelled TB to insane riches and fame and stuff. But I mean, Lost In The Woods is a perfect bit of indie pop for me, so I’m gonna say it should be the next single. It takes some lovely Fleetwood Mac, puts it in a blender with Turin Brakes except oh wait did I just add double TB in there? Apparently, Olly’s daughter Daisy is playing flute on this. And it all sounds so lovely smooth. What I’m trying to say is this is one of the highlights of the album for me. And did I say it should be a single? The album takes a much needed breather on Deep Sea Diver, providing a lovely late night, lo-fi acoustic instrumentation with Olly’s introspective lyrics (“Tied to my mast alone, it’s a deep sea dive back home”). Still lasting less than four minutes, it’s the first time the album slows down, and it does it well. The harmonies here are top-notch, and Gale’s slight guitar is great as ever. The title track is up next, Invisible Storm builds on piano and sparse chords up to an epic chorus. The song – like the whole album – deals with inner stress and feelings coming to the surface. In that way, the song references a whole bunch of other songs, including Panic Attack, Guess You Heard, The Door, Mind Over Money and many more. Fighting an invisible storm is something many of us do everyday, according to the band. The song ends as suddenly as it builds, and so one can only hope this gets an extended outro on tour. It’s a good feeling when you sing along to the chorus and, with the band, you end up hearing just silence at the end… I just wish the song would go on for a few more minutes…. Now Tomorrow feels closer to the Lost Property vibe than any other song. Maybe it’s because this song was co-written by Tom Speight, like some songs on the previous record, or because the guitar riffs feel similarly structured to Jump Start, but it’s a nice familiar sound after the slightly unfamiliar Everything All At Once. To my taste, the song would benefit from being a bit slower, the song is over before it has properly begun. Then again, maybe the point is to be short and sweet, and then have that chorus stuck in your head. In that case: it is a great success. Smoke and Mirrors has some lovely strings and additional instruments. Lyrically it’s quite minimalistic, calling up imagery like only the best TB songs do, but musically there’s so much going on. It’s the one place where the band take the time to really get going. It’s rewarding, it’s lovely and it’s great because of all that. And then that final song. Don’t Know Much fits in a great tradition of Turin Brakes songs, with slide guitar reminiscent of Future Boy and The Optimist. But with a Stranger Things reference in the first line, this is very much a song for the now. “Find a way to get through”, is what the band appear to be singing here. The whole band join in on the final lines, which has a nice emotional resonance. Lyrically, the song appears to be much gentler about our predicament than most of it what’s gone before (Pray the god or tuck you tie if you like, we don’t know much about this life). It’s a nice, fitting closer that has you thinking in silence for a while after the record ends. While yes, a part of me, longs for giving some of these tracks room to breath and extended instrumental breaks I’ve grown used to, Invisible Storm is clearly not the place for that. Instead, it still has rich instrumentation and bold production provided by our regular 4 plus co-producer Ali Staton, Dave Palmer (of Ether Song fame), Olly’s daughter Daisy and a string section. Invisible Storm provides a lot of additional little moments that I only picked up after a while. Don’t be fooled by it’s slick first half or it’s more in-depth second half: on both of those halves Turin Brakes do what they do best. They write direct, intimate guitar songs with cinematic lyrics, emotions and instrumentation. And believe me when I say that live these songs will work as great, if not better. 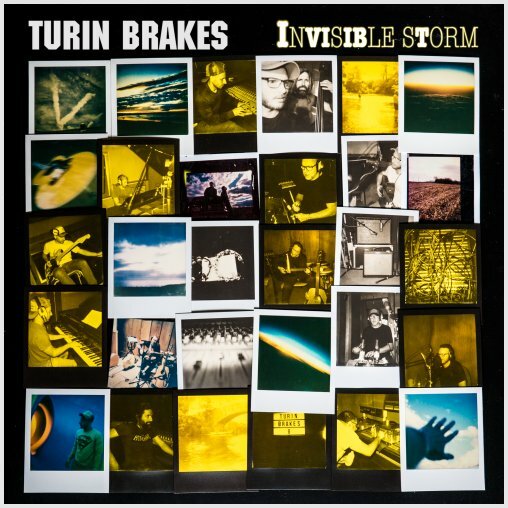 In the end, listening to Turin Brakes on Invisible Storm makes me feel warm and fuzzy and taking these songs on the road with me to work, or on road trips in the weekend should only make life better. They’re a voice of sanity in a world that doesn’t make sense, with songs that get stuck in your head as soon as you hear them. Let’s hope the album goes down a storm. Invisible Storm is out now. Obviously. Lovely in depth review of TB’s 8th album. Gotta day that I absolutely love this record – every little bit about it. It seems that every time I play it I pick up on subtleties and nuances I didn’t seem to have noticed the previous time round. Like you, track three had me wondering on first hearing it last Friday but now it’s firmly taken root and I’ve come to love it along with the rest of the record. The musicianship, as usual, is superb, the production is immaculate and once again there are lyrics that make you think; in my opinion it’s this that really sets Turin Brakes apart. I’ve read and heard the word ‘poppy’ applied to this LP but the idioms and metaphors that Olly uses to describe his feelings and views on the world are deep and often complex and it’s this that elevates the band and this album above simple pop. A great album that will surely transform itself into great live music – can’t wait!!! What a cheery happy go lucky album. I love it. Have to say I’ve not got to the turn around stage you found yet and am still sadly a bit underwhelmed. I’ve had the album on heavy rotation since release day now and I’m still yet to find a way into it, don’t get me wrong there are no bad songs on it and there’s a couple that stand out from the rest, it’s just that the stand out ones still feel like shadows of great songs and the rest are frustratingly six out of ten filler’y. Like you said in your review this a distinctly more popp’y sounding TB album than we’ve seen recently and I think that’s where its loosing me. I love a bit of TB pop but prefer is sprinkled in the midst of something a bit more, I’m struggling not to say ‘interesting’ here but that feels a tad unfair. Taking Lost Property as a recent example, ’96’ and ‘Keep me around’ are fun but it takes songs like ‘Save You’, ‘Hope we make it’, ‘Black Rabbit’ and ‘Brighter than the Dark’ to pull me back to the album time and time again. On Invisible Storm we’ve got the comparable duo of ‘Would you be mine’ and ‘Wait’ to kick things off but I’ve yet to find the heart of the album that will drag me back. ‘Deep sea diver’ and the last four tracks are the closest things come but while they’re all ‘good’ none seem to make the leap to ‘great’ for me seeming to shy away from the spine tingling in favour of something more easily digestible. Perhaps the best way I can put it is that when I put all the TB albums on shuffle (as I often do) I’m not going to skip over songs from Invisible Storm but I’m also currently unlikely to seek out the album and listen to it on its own. I completely get that no band is obliged to churn out album after album of songs designed specifically for me so I’m not in any way having a moan at the guys I’m just a bit disappointed that this album seems destined to pass me by.